So you bought a new generator so you would be prepared for hurricane season or a potential power outage, but it is in the box in your garage. Maybe you un-boxed it, and moved it to the corner of the garage just in case you need it later. Don’t wait until you need it, now is the time to start it up for the first time, before you experience a power outage. 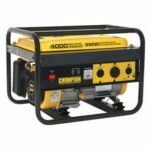 I know if you have never had a generator before it might be a little intimidating to start for the first time, but it is really very easy to setup. In this video, I am setting up a Champion 3500w generator but the process is pretty much the same regardless of what generator you have. I am using Mobile 1 full synthetic oil, which isn’t required, but I do think synthetic oil it is better on any engine than regular oil. This generator called for . 6 of a quart, which is about 19.2 ounces. I just happened to have a five-quart bottle in the garage that is why the bottle is so large. Also, make sure the generator is used outside only, 10 feet or more away from your residence and that the exhaust is point far away from your residence or where you will be residing/sleeping. You must have a working carbon monoxide detector if not two (depending on the size of your home) in your residence with one near your bedrooms or where you will be sleeping. The last thing you want to have happen is the fumes from the generator entering your residence and if they do a carbon monoxide detector should trigger an alert to wake you so you can get out.